Leaders after Tuesday’s games are Cuse Got Hosed and J-Cuse-Girl with 6 points each (out of 7 possible). Many brackets imploded with the losses by Ok. St. and Drexel. My guess is that both of those teams, having beat SU once already, decided they were too scared to face them again. Go here for complete score listings and other information. Dan (Syracuse): Doug, What do you think about Syracuse as of late? Have they maybe started to find their groove, the one we have all been looking for from the preseason? That was a nice win on the road at Marquette. Doug Gottlieb: It sure seems like Syracuse is playing now as we all expected them to play. Maybe it is the drecreasing minutes of Harris and going with veterans. Maybe it is the incredible offensive play of Eric Devendorf. Or maybe it’s matchups, as they are playing better D. They have held their opponents in the 30’s shooting percentage wise in the last three games, that will win you games. Todd (VA): Same multi-bid question, different league. With VCU leading the league, Old Dominion having quality wins, Hofstra lurking, and Mason starting to return to form, any chance the CAA pulls a second bid again this year? Andy Katz: You forgot Drexel. Everyone always forgets Drexel, which has wins at Villanova (possible bubble team) and Syracuse (possible bubble team). I do think the CAA has a shot at two bids but it’s going to be close again this season. Jon (NYC): Here are 5 SOS and 5 teams as of 1/16: 37, 80, 85, 107, 143 Clemson, Florida, Oregon, Syracuse and Wisconsin Now can you guess which team goes with which? You would assume if you listen to all the experts that Syracuse is 143, but SURPRISE SURPRISE, Syracuse is? 37! 37 (Syracuse) 80 (Clemson) 85 (Wisconsin) 107 (Oregon) 143 (Florida) Now can people please stop criticizing Jimmy B and Syracuse because they may have played at home (its called not losing money on your basketball programs) but they scheduled quality opponents, not cupcakes. Jay Bilas: You are correct. The people that criticize Boeheim’s schedule are incorrect, although I respect that reasonable minds can differ. In addition, Calhoun’s schedule was not wrong, either. He is building a team and trying to build its confidence. He backloaded it. Does anyone think that the Huskies would be better off by having played a bunch of tough games and lost them going into conference play? I agree with you. The numbers can be worked however you like. Rebounding can be a tricky stat category. Granted it’s never OK to get 18 fewer rebounds than Canisius, but that was a Gorman game, so I’ll let it slide. However, early season rebounding margins can be suspect because in blowout games the numbers get skewed for several reasons. First, it’s hard to muster up the passion and energy to hit the boards when the game is a laugher. Second, and more importantly, the offensive rebounding numbers are almost meaningless thanks to the radical difference in o-rebounding opportunities. Let me put it this way: if you want SU to get more offensive boards per game, the easiest way is to miss more shots, thus giving them more chances at O-boards. Conversely, if the other team is getting too many, the easiest way to solve it is to let them shoot a higher percentage. SU is shooting 47% from the field this year. Our opponents are shooting 37%. We’ve missed 358 shots, they’ve missed 474! That’s a hell of a lot more clanged shots that the other team has the opportunity to go get. Additionally, our major flaw this year is turnovers, so 20 times a game we have offensive possessions that cannot result in an offensive rebound. Also, we get to the free throw line enormously more often than our opponents (130 more times so far this year), and it’s extremely difficult to get an offensive rebound against any opponent off a missed free throw. The point is, I wouldn’t worry about offensive rebounding numbers in games where our offense is playing well and we’re scoring points. It’s much better to shoot a high percentage and not worry about getting any offensive rebounds. The only way we’re going to know how good we are at hitting and defending the offensive glass is to get into the Big East season where we’ll play close games against teams with equally athletic players and the shooting percentages start to even out. That’s when those numbers matter. Also, there’s nothing particularly wrong with being +3.25. That’s decent. For the record, we outrebounded Wichita State 43-29; were outrebounded by OK St 29-21; and outrebounded Drexel 44-36. I think turnovers lost us all those games, not the glass. I challenge anyone to take a look at this picture and tell me there’s not something going on with this team. Why else would Eric Devendorf, one of our strongest offensive players and most promising leaders on this team, be sitting on the bench during the huddle in the closing seconds of a close game? 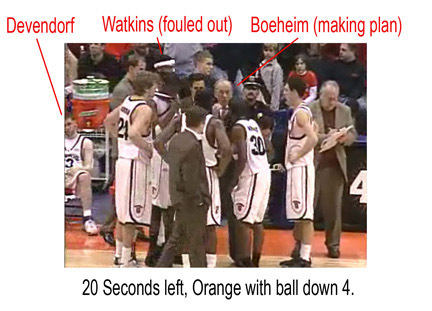 You’ll note that both Watkins (who had fouled out a few minutes earlier) and the random dome cop over Boeheim’s shoulder are more involved in the game plan than Devo. Also, does anyone keep track of the stat for field goal percentage on put-backs? We have to be somewhere around 20%. These guys consistently blow the second, third, and sometimes fourth chance on offensive rebounds, to the point where I’m sure we’d be better off if they kicked it back out every time. And it ain’t just terrenceroberts.com, since we were as guilty of it as ever with him out for the entire second half. I have to admit to be excited about tonight’s matchup against Drexel and not just because we’ll be facing a hot team, but because it brings me back to the two years I lived in Philly in a dump of an apartment building pretty much on the Drexel campus, where the residents favorite sport was not basketball, but punching holes through the thin plywood walls. Drexel students didn’t get fired up for basketball all that often, but when they did it was for matchups against other Philly schools and for Syracuse. While Drexel always longed to compete at a level of their Big Five brethren, they usually fell short of that goal. But this year, with wins over Villanova and St. Joe’s, their sights turn to the north. Their recent focus on the Orange has less to do with an ancient rivalry and more to do with a past neighbor. Hakim Warrick grew up in West Philly, only blocks away from the Drexel campus, and went to Friends’ Central School in Wynnewood, just up the Main Line from Drexel. Even while attending Syracuse, Hak would return home during breaks from school and shoot around on the Drexel campus with current Dragons. There was an article about it in the Post-Standard in 2004, but unfortunately the P-S doesn’t believe access to everything on the internet should be free. The Drexel student newspaper, The Triangle, wrote a brief preview of the game in 2004, which I distinctly remember because they misspelled both Hakim and Gerry McNamara’s names (although they at least corrected Warrick’s name for the online edition). They didn’t grace us with such an online preview for this season, although they are ready to answer the question of why Drexel basketball is better than televison. Too bad Warrick is headed to San Antonio for a game tomorrow or maybe he could attend. I guess Carmelo could show up to the Dome instead, as he won’t have anything to do for the next few weeks.